The SMA British Province has lost its senior missionary with the death of Fr Douglas (Dougie) Bluett in a London hospital on Monday, 27 March 2010. In recent years he had suffered from cancer though never allowed it to dim his missionary calling. He continually requested a return to front line service in Africa though his illness meant that his wish could not be granted. Fr Bluett, born in Dublin in 1934 was raised in the Church of Ireland before converting to Catholicism and becoming a Catholic priest. He was ordained in Keffi, diocese of Makurdi, by Archbishop Peter Y Jatau of Kaduna, Nigeria in 1972. 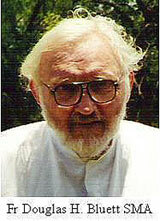 For 36 years Fr Bluett ministered in several parishes in the diocese of Makurdi, most notably Doma. He was a renowned teacher and for many years taught at St Thomas Aquinas Major Seminary in Makurdi. He had the great joy of seeing part the area where he worked made into a separate diocese, Lafia. Fr Bluett is mourned by his sister, extended family, friends and his confreres in the British Province as well as in the wider Society. Fr Rob Morland informs us that, in accordance with his wishes Fr Dougie will be buried alongside other SMA colleagues Manchester. Monday, 5th April: Reception of his remains at the SMA House, 33 Lyonsdown Road, New Barnet at 5pm. Tuesday, 6th April: A funeral Mass will be celebrated at 12 noon in the Church of Mary Immaculate & St Peter, New Barnet. Wednesday, 7th April: Mass in the chapel at St Mary’s Catholic Cemetery, Manchester Road, Worsley, Wardley at 11am followed by interment.